So many things in life are touch’n go. Will it work. Won’t it. Someone had the idea to bring a body deodorant for Pádraig. To be honest, I didn’t even know this stuff existed. But, there you are. I was about to say that Pádraig doesn’t take deodorant, never mind body deodorant when I realised that this was not about deodorant at all. This was about touch’n go. It was about will it work or won’t it. It was about Pádraig taking the bottle into his hand. His hand feeling it. Guessing what it might be. The taking the top off. Feeling the top. 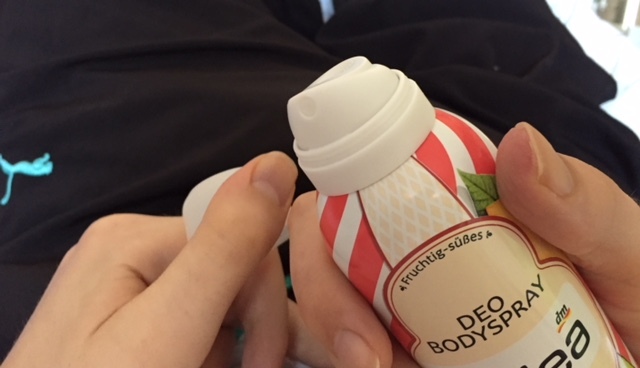 It was about moving the bottle up to his body and pressing that button that released a spray. Ok, it was “fruchtig und süß”. Probably. One that Pádraig would not have touched with a goal pole. But that didn’t matter either. It was about doing something with his hands. About moving his arms. About realising that his body was able to do useful stuff. Never mind the smell. I have been doing a few exercises myself – or: they were done on me. One was about positioning and the other was taking something into my hand with closed eyes and experiences that feeling of my hand trying to figure out what was going on. I am telling you there is nothing like experiencing even a tiny bit of what is Pádraig’s every day reality myself to just get a faint idea of what he is dealing with. I thought I had come back to the apartment late last night. It was an hour later tonight. Pretty intense days. Tomorrow and the following days, I will join a course on “Facio Orale Therapie” as there was seat available and the organisers invited me to participate. It’ll be an interesting few days. Never a dull moment. There is no life worth more living than what we’re living right now!